Send, sign and approve documents online. Upload your PDF and drag & drop fields easily. Simplify your processes, boost your productivity. 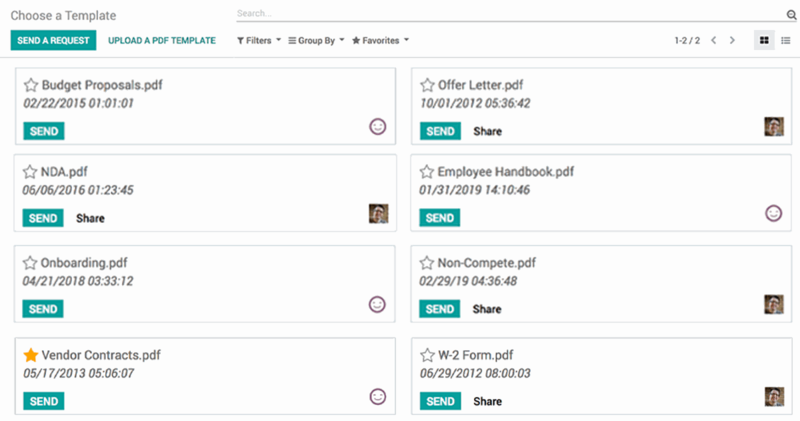 Odoo Sign is a fast and convenient way to send, sign and approve documents. Prepare contracts by dragging & dropping blocks to be completed by the parties, submit signature requests in seconds and track status of sent documents. Stop waiting days or even weeks for all parties to sign your documents. Move forward and close your deals in just a few clicks. Eliminate manual operations and improve the quality of the documents filled out and signed. Make sure parts that require a signature are signed. Improve win rates and reduce the sales cycle by automating the signing process of your contracts. Improve your relationships with customers. Improve hiring processes and interactions with applicants by sending electronic evaluation forms and employment contracts. Easily keep track of all documents, delays and procedures. Stay organized at all times with all documents available electronically at hand.